Rams Young’s registered the Ram trademark in 1893, and since then countless breweries have also used a ram or sheep, from the Black Sheep Brewery to the RAM chain of brewpubs. Moose & Squirrel I can’t over emphasize how much of a huge fan of Rocky & Bullwinkle I am. I had the great pleasure to meet Jay Ward very briefly in L.A. in the mid-1980s at the Dudley Do-Right Emporium. So anything with a squirrel or a moose and I’m in. I even tried to get Bullwinkle on the short list of names for my son — my wife wasn’t having any of it. So while Big Sky’s Moose Drool or New Glarus’ Fat Squirrel Ale are fine by me, Laurelwood’s Moose & Squirrel Russian Imperial Stout is the bee’s knees. Fish While I’m no fan of fishing — to me it’s just standing next to water with a pole in your hand staring into space — for people who do get more out of it, beer goes with it like nothing else. It couldn’t hurt. 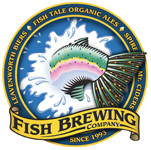 And so there are Flying Fish, Fish Brewing, Steelhead and a Dogfish. 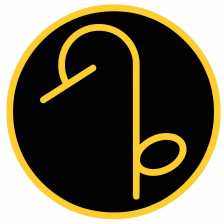 As a Pisces in good-standing, I love all things fish, except eating it (unless fried and with chips) or trying to catch one with string, a stick and a worm. Bigfoot / Sasquatch Seen only once each year, usually in mid-January or early February, though it’s not the only sighting of Bigfoot. Up in Eugene, Oregon there was Sasquatch, now a part of the Glen Hay Falconer Foundation and Sasquatch Stout from Old Yale Brewing Company in B.C., Canada. I picture that grainy film of bigfoot lumbering through the forest, but with a beer in his hand. 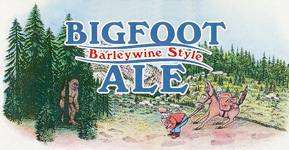 But this year is the 25th anniversary for Sierra Nevada’s Bigfoot Barleywine Style Ale, making it the one to hunt for. Elephants If the sight of pink elephants doesn’t give you tremors, then you haven’t had enough to drink yet. Have a few more cans of Carlsberg’s Elephant Beer. They may not be pink, but they’ll still have you seeing the pink variety. Lions Hard to believe, but lions once roamed Europe and didn’t become extinct until as late as 100 CE in some parts. 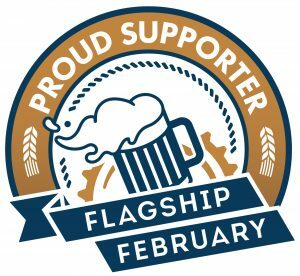 That’s at least part of the reason why the lion is such a part of European mythology, and is on flags, coats of arms and, of course, on beer labels. 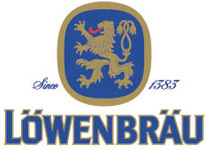 Lowenbrau means literally “lion’s brew” and the one in Munich is by no means the only lion’s brewery. 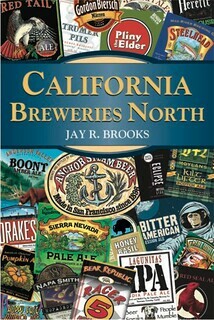 There’s lion beers around the world and Lion Stout and a Lion Brewery in Pennsylvania. Birds Believe it or not I have a strong affinity for birds. Being a Jay myself, some of my happiest moments as a child were birdwatching with my aunt and grandmother and one of my earliest merit badges was for birdwatching, too. 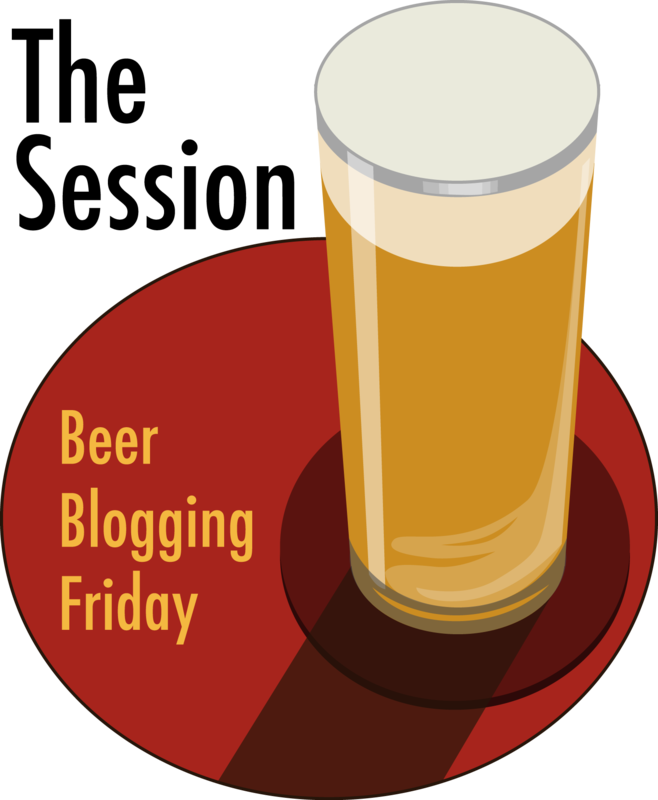 According to the International Bird Beer Label Association (IBBLA), there are at least 310 beer labels with a bird on them. From Antarctica’s penguin to the bald eagle on Yuengling’s Traditional Lager, the hummingbird from Humboldt and all the Hawks — Red Tail, Black, White and the Eye of the — from Mendocino, birds are all over the world of beer. Dogs Dogs might quite possibly be the most popular animal on beer labels. 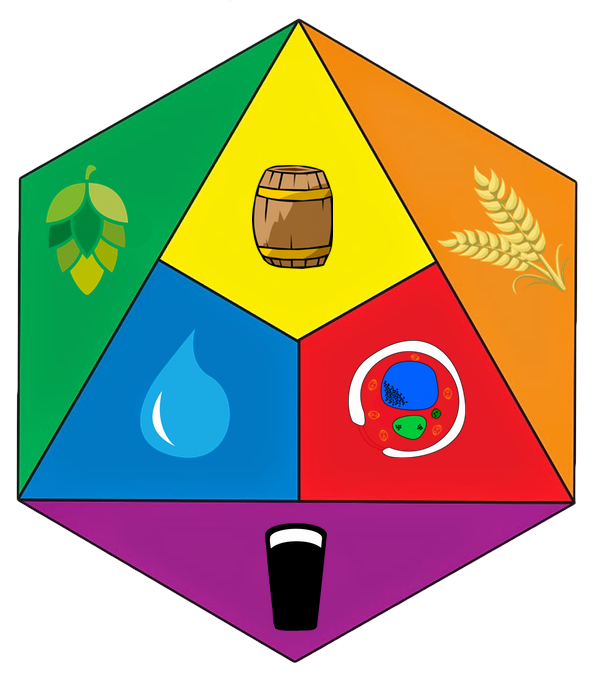 Many breweries have their own dogs and Rogue even has a festival for their dog Brewer, who passed away a few years ago. In Australia, you can even get a special beer for your dog. 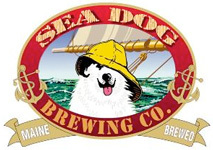 There’s Flying Dogs, Sea Dogs, Brew Dogs, Red Dogs, Laughing Dog, Thirsty Dog, Big Dog, Lazy Dog, Ugly Dog, Blue Eyed Dog, a Hair of the Dog, and even Lucky Labrador. 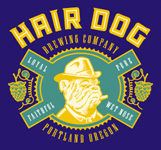 There’s a Turbo Dog Beer, a Fat Dog Stout, Dogfather Imperial Stout and Old Leghumper. Man’s best friend is undoubtedly a brewery’s best friend, too. Goats The German style Bock began in the town of Einbeck. 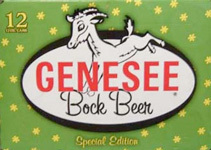 The name is a corruption of the medieval German brewing town of Einbeck, but also means male deer or goat in German; the word is a cognate of the English “buck”. 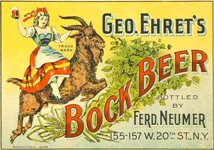 So it is that goats are often featured on bock beer labels. 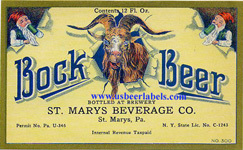 They’re downright ubiquitous, and in fact it’s more unusual that a bock beer label doesn’t have a goat somewhere on it. Other animals considered were the wonderful Griffin, but since that’s only Fuller’s it didn’t make sense to include. I certainly couldn’t include talking frogs or flatulent horses. I considered deer, usually called Stag beer. And apart from rhyming, what do skunks have to do with being drunk? Also, if you have any ideas for future Top 10 lists you’d like to see, drop me a line. 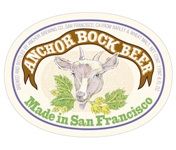 Regarding bock, I always thought that it was named for the kick it had. 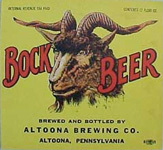 Bock meaning goat, the bock category was symbolic of a goat kick. A little bit of a stretch, but I think it works. 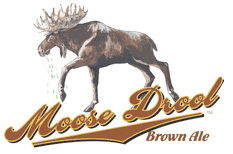 Learned something last night, the Booneville Bear is actually the Booneville “Beer” (Bear + Deer = Beer). I’ll be hoisting a pint to Spuds McKenzie, the original party animal. Wow…some really beautiful graphic design on some of those classic old Bock Beer labels. Thanks for including them! 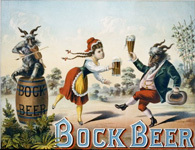 Incidentally, Leinenkugel’s “Bock” taste about like a goat would. Man is that a weird label. Once you see it, you never forget it. I can clearly see it in my mind’s eye…that’s a very good one. I’ll always have a spot in my heart for Haskell, the Schaefer Bear.